As visitors to grand Palaces, Temples, Mosques and Tombs, we are likely to come away more with awe than with a picture of what we have really seen. Often, details merge with a memory of the whole. Until someone points out the complexities and captures them so we can study how the place came to be. 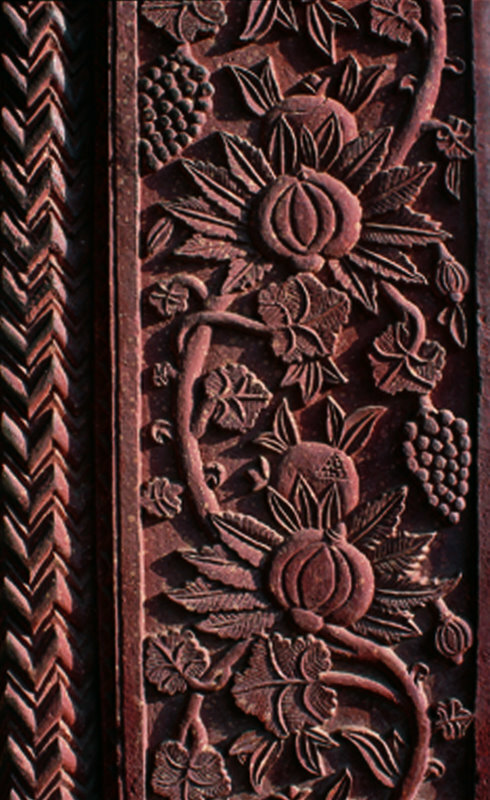 Henry Wilson’s Pattern and Ornament in the Arts of India is a book about such details. The ones we might miss in a rush to photograph the entirety or struggle to recall in the midst of colour, light, sound and movement. The introduction sets the real premise of the book. The author-photographer shares pictures of patterns and prints from all over India – henna, truck art, block printing, textiles, floor tiles – and clearly states that this book will not be covering any of them. 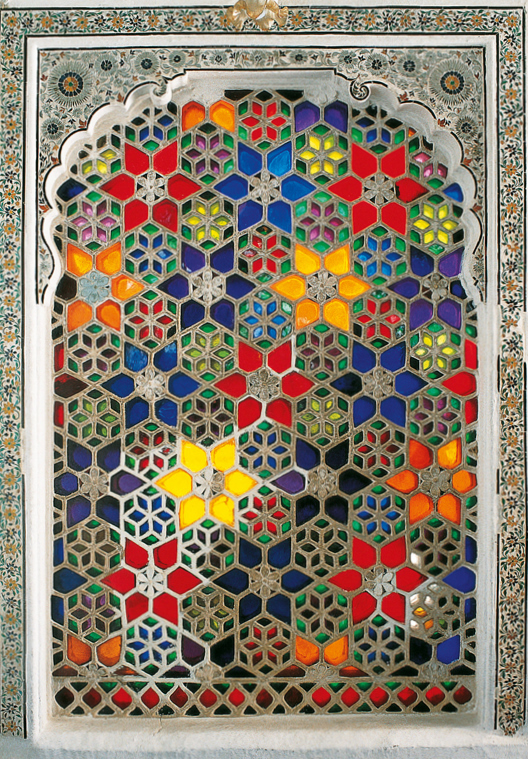 This is a book on Pattern and Ornament as seen in the Architecture of North-West India. And to that end, the book is faithful to its subject. 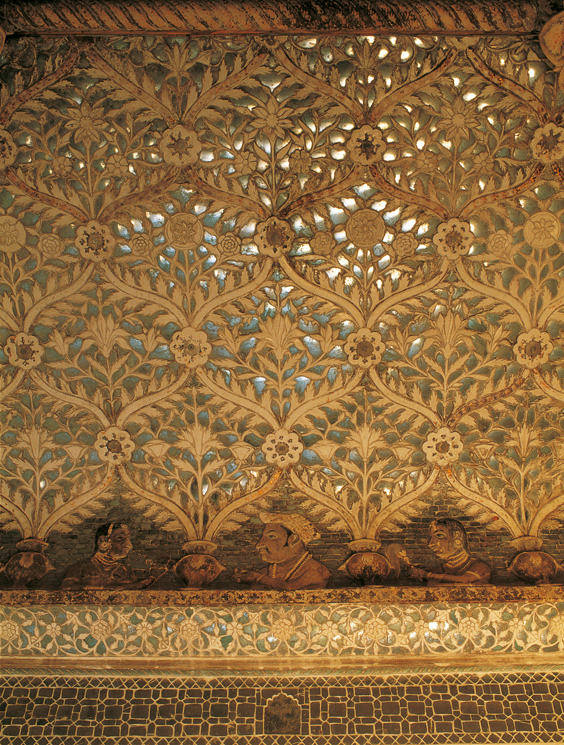 The tomb of Itimad-Ud-Daula at Agra is covered with patterns in 'pietra dura'. The chapters are divided according to the nature of work being dealt with – repeat patterns, borders and bands, single motifs and panels, ornamental scenes. It is clear that it is not just a pretty coffee table book. 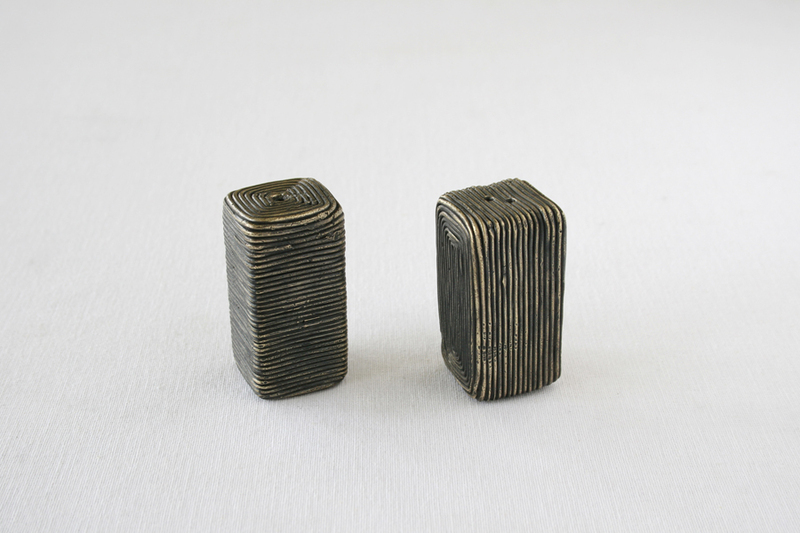 It is designed to be used, as a design source or for those interested in details and patterns in architecture perhaps. The Aam Khaas in the Juna Mahal in Dungarpur. Everything is covered with mirror or coloured glass. The floor is of mirror, with designs painted in colour between the glass and its silvered backing. The selection of subjects is striking. The Juna Mahal in Dungarpur was a revelation – the chevron motif in the Aam Khaas, the painted ceilings, the shish mahal with marigolds in mirrors, the mirrored floors. 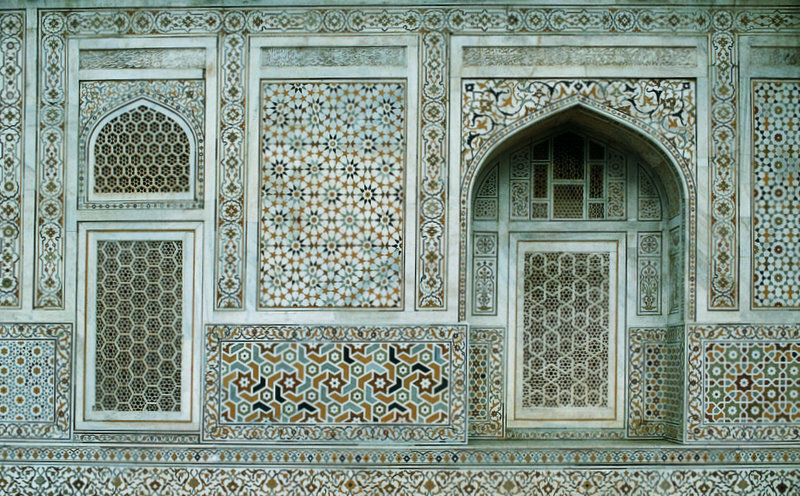 As were the staggered squares on the Red Fort in Agra or the geometrical flowers in pale yellow sandstone on the Intimad-Ud-Daula – where every corner is filled with intricate patterns. Also striking were the pillars of the Chaumukha Jain temple in Ranakpur, the water channels in Mandu, the wood carved havelis in Ahmedabad, gesso work in the Anup Mahal, the Jai Mandir, intricate jaali work at the Sidi Sayed Mosque in Ahmedabad, peeling wall paintings in the Bundi Palace, the ceiling of the Sultan Mahal in Samode Palace. The text that introduces each chapter has interesting observations on each. At the Sidi Sayed Mosque in Ahmedabad, 1573. Thin slabs of stone are individually perforated with a small section of the pattern, and then pinned together to complete the overall design. 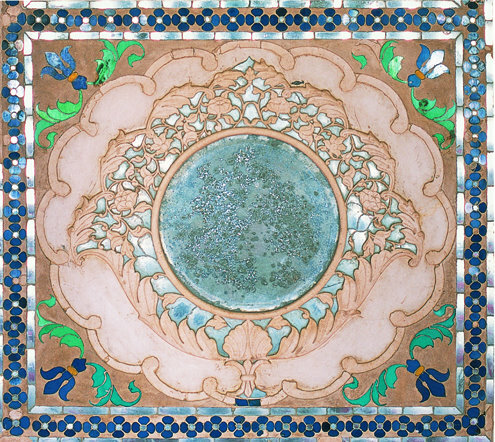 A mirror on the ceiling of one of the royal sleeping quarters in the Meherangarh Fort at Jodhpur, in low-relief plasterwork and mirror and painted glass inlay. 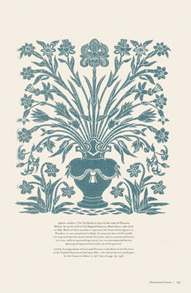 Henry Wilson shares tricks and techniques used to craft some of these patterns and ornaments – straight lines were made using string and chalk, repeat motifs were made by pouncing – a method where a drawing is made on paper and the line is perforated and paper is laid on a surface and powdered and it falls through to replicate the design. Much like Rangoli. Only in the case of the Rangoli, that is the object of the effort whereas here, it is the prep work. Of the pattern of monsoon clouds on the walls and ceilings of Badal Mahal, Wilson says, ‘they froze transient nature into stone’. 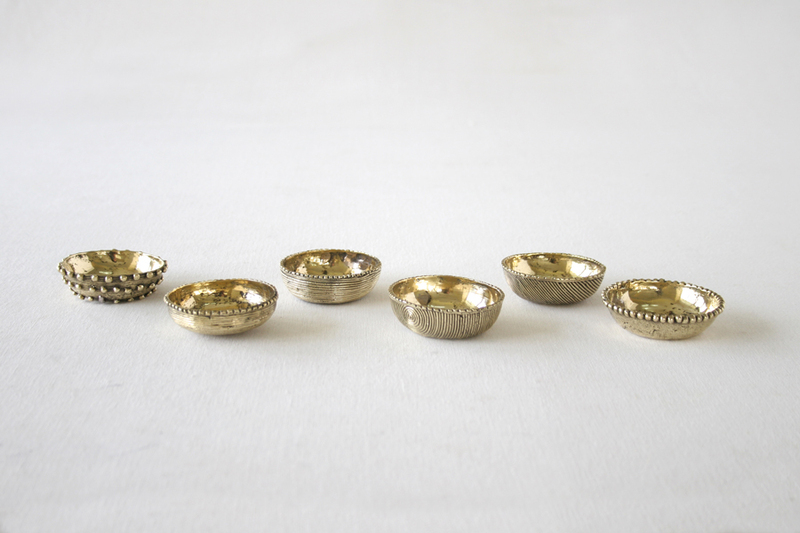 He quotes architect BV Doshi who said that craftsmen spiritualise the material they work on. And there is much evidence of that in the book. 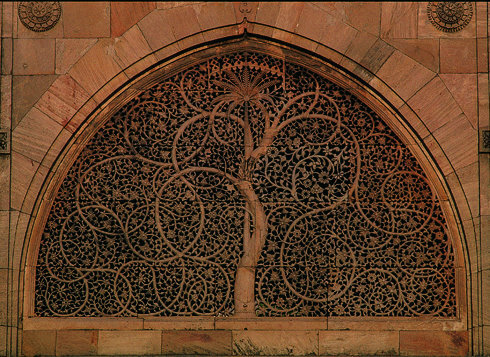 Technical drawing of a composition of trees and flowers in the dado of the Pavilion of the Turkish Sultana at Fatehpur Sikri. “Omne ignotum pro magnifico” – All things unknown seem grand. Though here, in the revelation of the blueprint of the work, it seems more magnificent when known. Henry Wilson takes details and represents them as technical drawings – a decision that makes this book appealing. The technical drawings make the patterns and ornaments approachable, as works of artists who were human. The form, the rough idea – the picture behind the picture emerges and one can understand the art by understanding the craft. Not all the drawings refer to the pictures shown. Some represent variations of the same design seen in another corner of the same room or structure and some, as in the case of the ceiling detail of Juna Mahal, are what it could be if used in repetition. Thus I would recommend reading the text to better navigate the pictures. 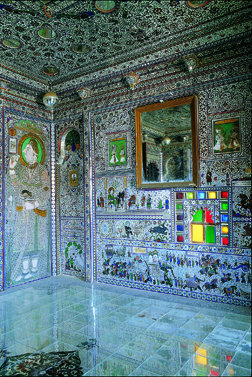 The Shish Mahal in Deogarh Palace has windows with coloured glass. At the Chandra Mahal, patterns with flowers where the background is set with chips of mirror glass. The book does have a few weaknesses. The title leads one to expect more from its content – it would be far more accurate if it said ‘Pattern and Ornament in the Architecture of North-West India’. The text is a vital part of understanding the book – both its flow and its content – though the matter is condensed in small point size over sheets that are coloured. It does strain the eye quite a bit. At Fatehpur Sikri. On the Pavillion of the Turkish Sultana, vertical borders with pomegranates on the main stem alternate with grapes. The author acknowledges “It would take many dense volumes to cover comprehensively the applied arts of India, from Neolithic cave paintings to the exuberant tailfin design on an Air India Express 737.” Yet it is all this that I hope will follow. The book has the potential to be a valuable series. It is, no doubt, a good resource for designers but it provides a way of seeing that all of us could enjoy. One sees the whole and one sees the detail and it is a fuller experience. A book to be used, not just admired, for its rich content. > Henry Wilson is known for his photographs of India, which have appeared in many magazines and books, including Benares and India Contemporary, both published by Thames & Hudson. 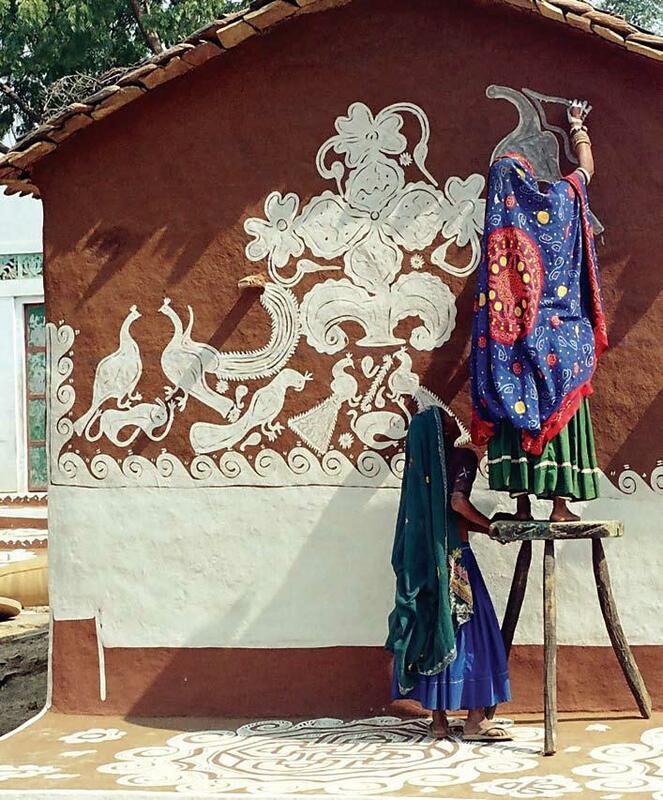 His drawings of Indian motifs inspired Osborne & Little to commission the Sariskar Collection of wallpapers from him. 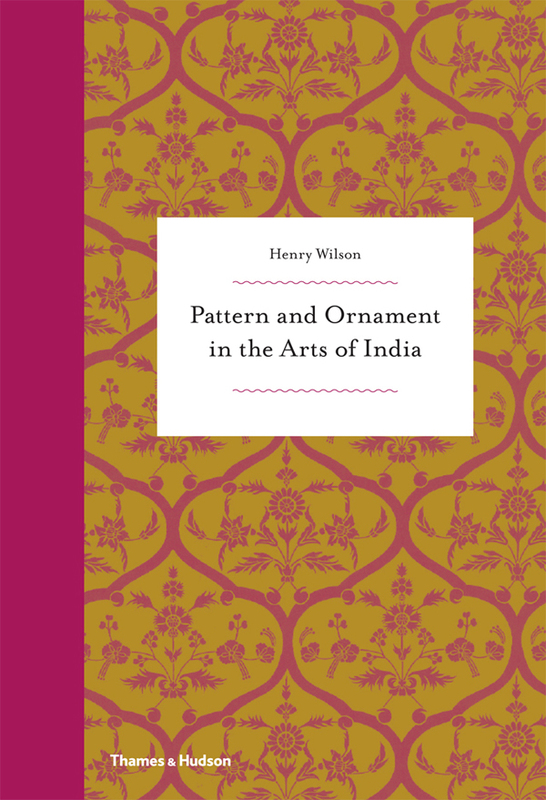 Pattern and Ornament in the Arts of India. Henry Wilson. With 223 colour photographs and 89 drawings. Thames & Hudson. ISBN 9780500515822. First published 2011. Get your copy here. I picked up this book in November and am yet to sit with it and savour it in detail. I knew this was one book I just wanted to have. It was strange, I discovered that I pick up books before I see who the author is & when I was standing at the checkout of the Oxford book store, I was startled to see that i had just picked up 2 books by Henri Wilson. Funny.